To be very honest, ever since I developed this theory and its gravity began to sink in, I have felt very strange. I have a new found respect for mother earth and the punishment she endures. I have a new appreciation for our lives and health and our bodies’ ongoing attempt to repair and replace damaged cells. I believe life is doing its best to thrive in a universe that appears mostly hostile to it. I also believe we may be surrounded by significant life residing in the collapsed state of matter, which appears much more stable than our fragile version. We may also be surrounded by others that have mastered this collapsed state of matter. I also cried and thought about my parents and protecting my children from something I cannot see. My explanation is either a great scientific work or an average science fiction story. The pieces seem to fit. I will let nature and others decide. I can now explain (at least to myself) one of the primary triggers for many Earthquakes, Tsunamis, Sinkholes, Hurricanes, Tornadoes, Volcanism and other high-energy destructive Earthly events which should aid further in their prediction, protection of lives and possibly someday prevention. My explanation includes a particle of “collapsed” matter with electromagnetic and thermodynamic signatures. If I am correct, I thought it was important enough that I should get the information out before refining my theory to a research paper since my main interest is making it useful to others and I do not make my living off writing research papers. There is significant circumstantial evidence and calculations to support my theory that the current Louisiana 2012 Bayou Corne Seismic events, sinkhole creation and Hurricane Isaac were all created from the same source of energy. In addition, the 2012 Erie Canal sinkholes, seismic event and Hurricane Sandy, the 2011 Virginia 5.8 Earthquake & subsequent Hurricane Irene, the 2010 7.0M Haiti Earthquake and subsequent floods, the 1989 Loma Prieta Earthquake and many, many other high energy events were all initially triggered from the same source of energy: Collapsed dark matter, weakly interacting massive energetic entropic particles orbiting above and entering through the surface of the Earth into orbit with the Earth’s center of mass in a multi-body decaying orbit pattern with other particles. These particles are expelled from the sun during solar flares and coronal mass ejections (CMEs). Their orbits should reflect closed string patterns and interact as predicted by M Theory and particle interactions. I predict that these energetic particles, which create thermodynamic instability within their environment, gain and shed mass as they move into and out of the Earth and atmosphere. Due to weak interactions with matter through Beta Decays and Low Energy Nuclear Reactions (LENR), they accelerate in mass-energy dense environments and generate a charged ion tail, making their trajectory through the atmosphere follow mass-energy dense condensed water and somewhat uncertain. The particles act as closed strings and interact with other particles orbiting in strings into the Earth, to eventually decay through quantum decoherence or coalesce with other dark matter particles or the Earth’s entropic core. In the atmosphere, along the elliptical orbital arc of the speeding entangled particles that behave as waves, an intense, localized low pressure system or trough is created. 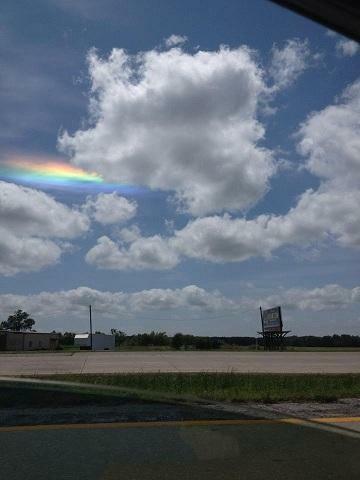 This can also result in contrails/clouds, rainbows and ice halos depending upon the speed and mass of the particle(s). Depending upon the paths, upsets to the ionosphere and magnetosphere may also be seen. Weather patterns and magnetic disturbances will follow the path of the particle’s arc back to the site of the initial entrance of the particle. Only a particle of a certain momentum will be captured in Earth’s orbit. Particles travelling below escape velocity will enter the earth and will gradually orbit towards the Earth’s core, most likely to decay or coalesce with other particles, with seemingly little consequences (unless massive ones pass through you). Particles with escape velocity will pass through Earth only one time and may or may not cause any significant damage. Since these particles and strings (branes from M Theory) behave via quantum interactions, they will obey the Schrödinger equation for multibody particles. Recently, scientists have strong indications that the Sun is surrounded by dark matter, a form of ultradense collapsed matter which does not reflect light. Dark matter may in effect be the same or similar state of matter to that which comprises black holes which absorb all light/radiation/matter in its vicinity and also emits ultra low frequency (ULF) black-body radiation (Hawking radiation) due to the strong redshifting from its intense gravitational pull on any radiation leaving near its surface. It is believed that Dark Matter occupies approx. 23% of the universe and known matter only approx. 4%, the rest being dark energy. From a seismic standpoint, after one of these massive particles has entered into a circumhorizontal orbit above and/or below ground, one may observe a low frequency seismic or magnetic signature typically with a typical period of 1-100 seconds or longer (0-1 Hz frequency range) depending upon the initial orbital speed and orbital distance traveled by the particle. If the particle happens to pass thru any dense structures above or below ground, it will gradually micro fracture that structure (quantum/micro gravitationally) thru beta decay and low energy nuclear reactions and the surrounding matter may emit typical higher frequency seismic signatures as the matter eventually fractures. While the particle is spending part time in the earth and part time in the atmosphere, a seismic signal will be picked up only part of the time throughout the period. Magnetic signals may also be detected reflecting both the above ground and below ground periods (possibly two-separate signals) converging to one signal once the particle’s orbit moves permanently underground. ULF radiation was picked up by the Demeter satellite over the recent Haiti, Chile and Somoa earthquakes as well as researched by Stanford at Loma Prieta California Earthquake in 1989. ULF signals were also detected in the 1999 Taiwan “Chi-Chi” earthquake, Guam, and Biak earthquakes. The ULF signals should gradually increase in frequency as the particle’s orbit decays (gets shorter). A longer frequency signal may indicate a longer or slower orbit depending upon the momentum of the particle. 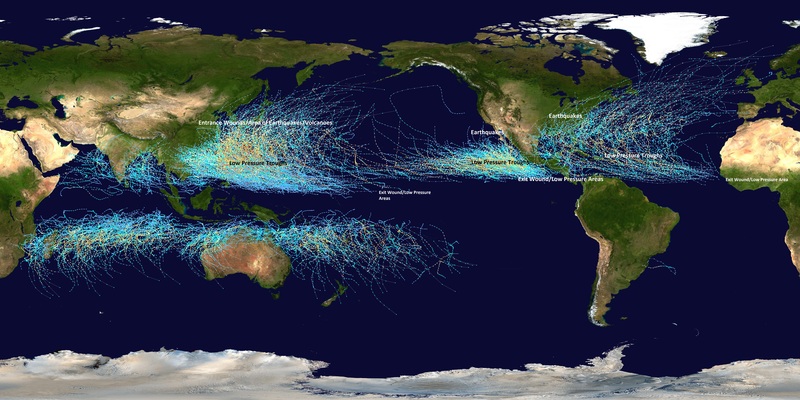 In a recent study by the University of Miami they established a link between Earthquakes and Hurricanes. They primarily link the destabilization of Earth due to the structural damage from enormous amounts of flooding. My theory shows that much structural damage is done by the massive particle prior to, during and after the arrival of the intense low pressure systems connected with the seismic events. From that point on the earth will remain less stable along the path of the particle. The “Seneca Guns”, “booming” and “Artillery fire” heard at many earthquake sites are actually sonic booms from the massive particle travelling at speeds in the hundreds or thousands of miles per second. They should appear with the same frequency as the ULF seismic and or Demeter Satellite signals. These sounds were witnessed at both New Madrid and Tunguska. I would expect more of these to be heard at exit wound vs. entry wound locations due to a larger instantaneous release of energy from evaporation of mass by the particle as it leaves the more dense earth, but they probably can happen at any point along the trajectory depending upon ambient conditions. Hurricanes by themselves can release as much as 1x10E8 Joules of energy per day. An 8.1 Richter scale Earthquake is equivalent to releasing 89x10E15 Joules of energy to the surroundings. These are enormous amounts of energy. 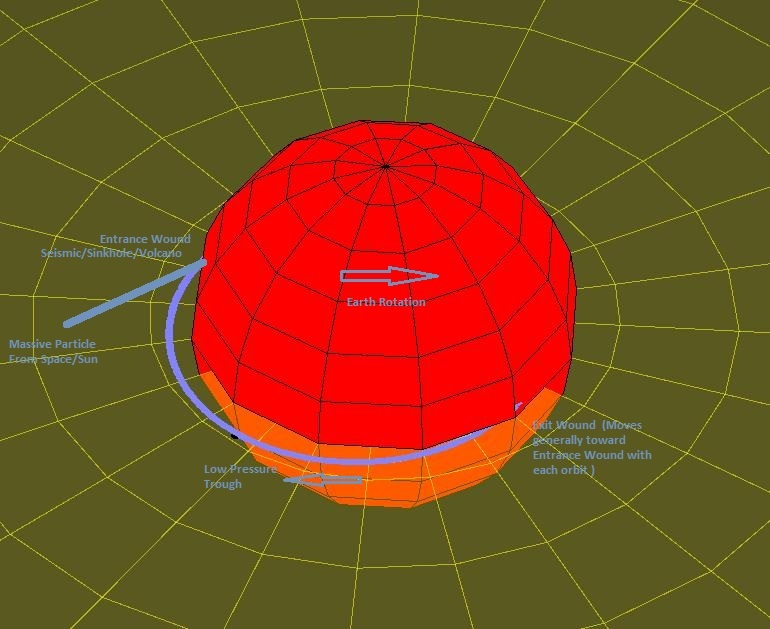 The red circle below represents the Earth and the blue circle represents one potential orbit of collapsed matter entering into orbit with the Earth based upon a given impact angle, mass and velocity of the dark matter particle. In the graphic below you can see that the collapsed matter actually orbits both above and below the surface of the Earth and around Earth’s center of mass. I consider the site of the initial strike to be the “entry wound” to mother Earth. I consider the exit point of the massive particle to be the “exit wound”. I believe the massive particle will thermodynamically shed/radiate some of the additional mass picked up on its orbit through the Earth at the location of the exit wound (either into the ocean or atmosphere, depending upon location). During successive orbits, the massive dark particle slowly decays in orbit due to weak interactions and interactions/annihilation with other orbiting particles. It is currently understood based upon observation that the entrance wound many times stays at a fixed location on Earth, while the exit wound location will steadily approach the entrance wound as the orbit decays over weeks or months (or possibly longer). I call this time period “coming home” as the low pressure system follows a low pressure trough created by the particle’s orbit in the atmosphere. If the entry point or exit point stay at a fixed location, nuclear beta decay will gradually fracture the Earth, triggering sinkholes, seismic and/or volcanic activity. The most intense area of the low pressure system will be at the particle’s exit point from warm oceans where there is plenty of water vapor to condense in the atmosphere. The ultradense particle is actually collapsing atmospheric gasses around it as it travels through the atmosphere, creating intense low pressure and contrails and clouds along its path. A Dark Matter entry wound location, bored out over the life of the particle orbiting from its circumhorizontal arc above ground and into Earth can be seen in the picture below, which is a recent sinkhole in Guatemala. As the subsurface of Guatemala is primarily Limestone, it reflects structural perturbances clearly. This sinkhole, which appeared around May 31 2010, was linked to tropical storm Agatha, which hit about the same time/just before it was discovered. 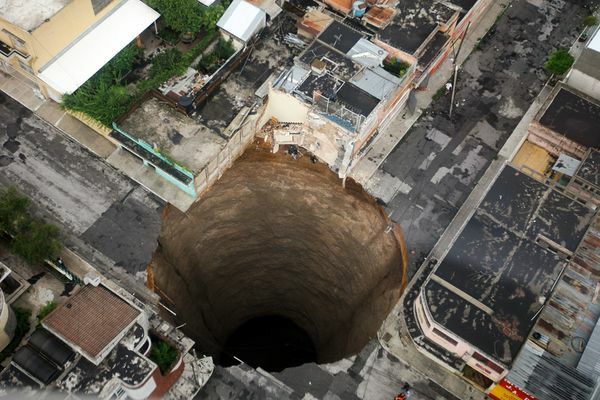 My theory predicts that the sink hole (entrance wound) diameter started as a very small diameter collapse with each pass of the particle and was building over the time that tropical storm Agatha (following the exit wound path) was on its “way home” during orbital decay and approaching the sink hole location. 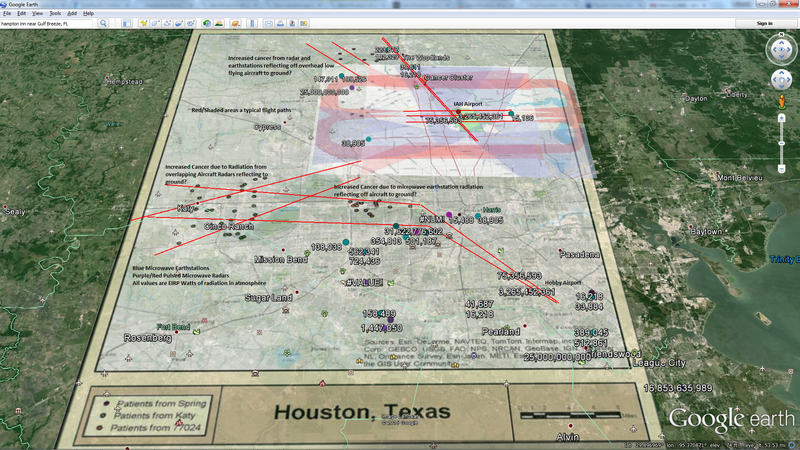 The Bayou Corne entry wound location can be seen in the photo below. The sinkhole matter collapsed over the period of a few weeks in July and August of 2012 when low level seismic signals were first detected. 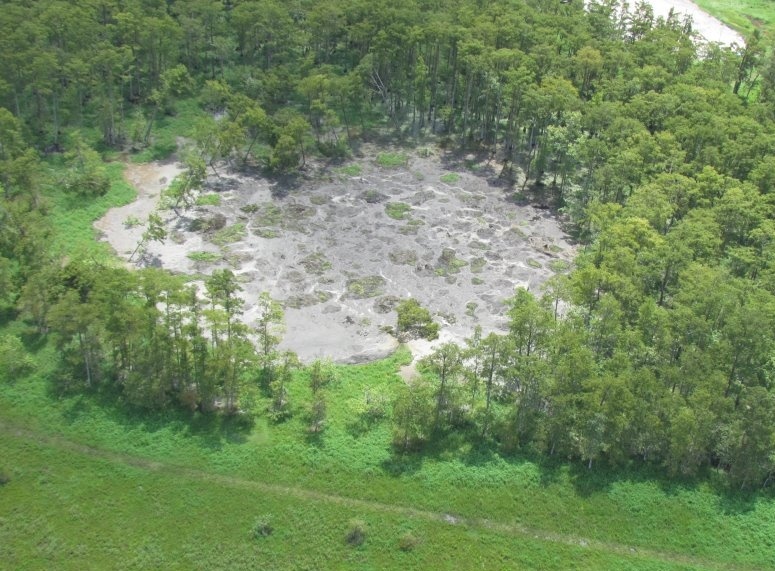 Hurricane Isaac had a direct hit on this sinkhole in September 2012, approximately 2 months after seismic swarms with ULF signature were detected before the creation of the sinkhole. Seismic events began occurring in June/July 2012 and peaked around the time that Isaac came onshore. Isaac actually appeared to stall somewhat over the area of the sinkhole in Bayou Corne. One can also see from the chart below that Isaac’s strength and rotation quickly dissipated after passing Bayou Corne. My theory predicts this is due to the fact that the storm’s primary source of energy, the massive particle orbiting, had now gone below the surface of the Earth. 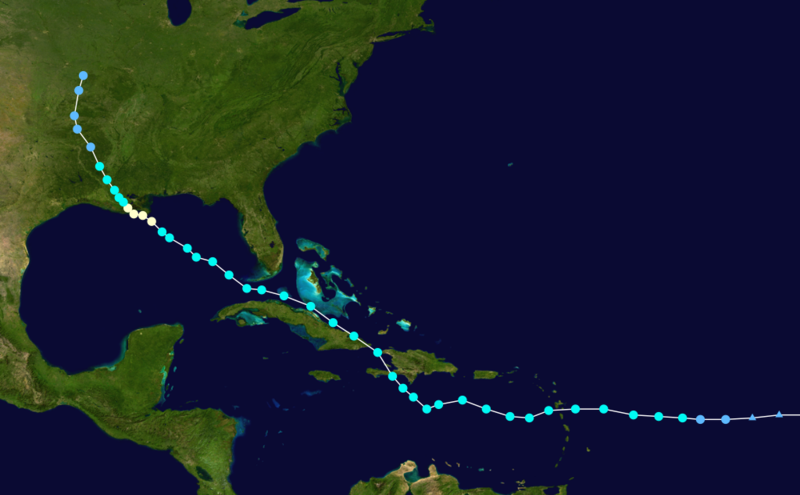 A chart of Isaac’s path can be seen below: My theory predicts that the intensity of the storm would increase directly in the Bayou Corne area because the elevation of the orbit and intense low pressure/cloud level dropped down to very low levels in the atmosphere just above the sinkhole area as the particle’s orbit approached the entrance wound (sinkhole), adding to the destructive force of the hurricane in the immediate vicinity. The massive dark matter particle should also ionize the air around it and also condense any vapor due to the extreme local gravitational pull in its path. The following picture of the sky was taken just south of the Bayou Corne area in the days before Hurricane Isaac came ashore. Similar circumhorizontal rainbow arcs have claimed to be seen prior to many Earthquakes. My theory predicts that these will be caused by either ionized air from the dark matter particle and or a path of extremely cold, low pressure air created in the vicinity of the particle due to its massive gravitational pull on the surrounding gas. My theory also predicts the massive dark matter particle can produce a contrail of condensed water vapor and earthquake lights as seen in many photos and videos prior to Earthquakes. On August 23rd 2011, a 5.8M Earthquake hit Stafford County, VA. On/around August 27th 2011 Hurricane Irene made landfall and proceeded over that location. Sinkholes were also found in the area. One interesting video from the Fredricksburg Area just hours before the Earthquake shows what I believe is most likely dark matter entering Earth. I believe this is vacuum energy, basically a micro black hole sucking the entropy from its surroundings. I would think that at first the particle will cause extreme upset to the local thermodynamic and gravitational stability of matter in its new environment but once it settles into orbit it will achieve some level of thermodynamic stability with its surroundings. The orbital frequency of the particle, which depends upon the initial speed and orbital path of the particle around Earth’s center of mass can be the explanation for the noises heard by many people prior to Earthquakes such as in the following video as well as many of the orbital sounds heard around the Earth such as in the following video. One can see from the picture below that hurricanes generally follow established paths and fit with the locations of entrance and initial exits from my model. At this point I will assume much of this dark matter may come from the sun during high solar activity. Many of the high energy events on Earth are triggered from relatively massive dark matter particles striking and orbiting around and through the Earth. These include Earthquakes with a ULF signature prior to the primary event, including most swarms, volcanoes with ULF signature, tornadic events, waterspouts over water, sinkholes and other localized structural failures. Just like any other gravitational body, there is a combination of approach angle, mass and velocity which will cause these particles to be caught in orbit with the Earth. Some particles should pass through only once if they have escape velocity. Others will enter into a decaying Earth orbit and eventually be annihilated within the Earth’s core. Some dark matter particles may enter into an orbit in space around the Earth. Assuming there are multiple dark matter particles active within Earth’s orbit concurrently (since there are multiple concurrent intense low pressure systems), it makes sense that as they approach another massive particle they may orbit and interact based upon particle interactions, either reducing or intensifying the low pressure system’s effect as well as impacting its direction for no apparent reason as witnessed with the following track. The Earth is being struck by weakly interacting massive dark matter particles constantly, many particles get captured in a decaying orbit and are possibly annihilated by other dark matter particles. Orbiting dark matter has a large impact on our weather patterns and determines them to a great degree. Many single pulse seismic events are probably caused by the thermodynamic release of energy from dark matter exiting earth and heading into space with critical escape velocity. Many of the extinction events on Earth, such as the K-T extinction event may have actually been periods of large/multiple dark matter orbital activity which caused extreme seismic activity, extreme weather and volcanism. The craters seen may be beta decay sinkholes or exit wounds of massive particles releasing large amounts of energy as they come to thermodynamic equilibrium passing from Earth to air. The Tunguska Event may be either an exit wound from a large dark matter particle orbit or a particle collision/annihilation event. The metal ore found may have come from the Earth’s mantle/core. Water spouts formed over water on clear days are created by similar orbiting particles. I have concerns with health impacts to biological entities passing through or stationary in an area where these massive particles are streaming/orbiting such as stroke, heart attacks, tissue damage, etc. Dark Matter exiting from the earth into the ocean and/or waters may create fish kills in the immediate area from the instant thermodynamic concussion of the speeding matter evaporating to a less dense environment and creating a shockwave. Dark matter orbiting through the skies at extreme velocities can kill birds and other avians nearby that are killed by either the concussion within the air or gravitational collapse and trauma. “Seneca Gun” booms are actually high speed dark matter particles triggering sonic booms in the atmosphere or in cavities underground due to the rapid collapse of gasses. 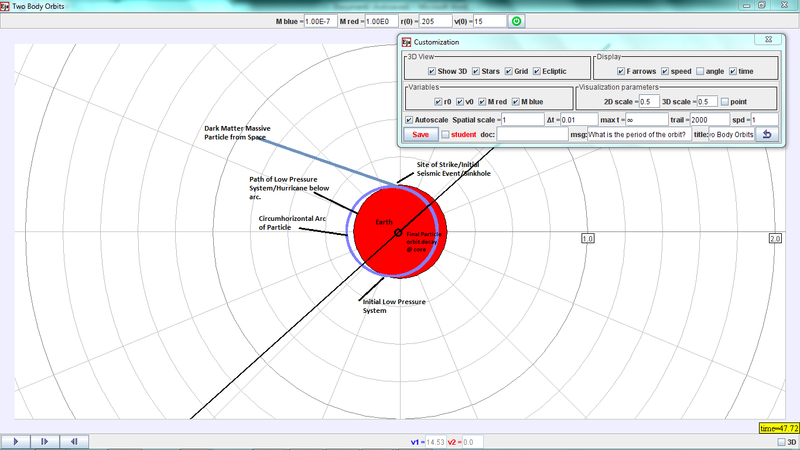 Equipment/Failure impacts to equipment /plants/airplanes located at the location of the entrance wound of these particles or passing through the orbital path. For example Nuclear Power Plants, spent fuel pools and nuclear weapons storage. Ability to locate and isolate dark matter particles through ULF detection or localized thermodynamic effects. National Security implications. Nothing on earth above or below ground is safe from an orbiting massive dark matter particle with high dark kinetic energy and the beta decay triggered in its path. Long term health and premature aging of humanity. Nature has programmed our bodies to renew cells and fight the detrimental effects of dark matter. Eventually dark matter wins out. Many volcanoes and impact craters seen on our moon and other planets and moons are probably dark matter strike entrance and exit wounds from beta decay. The particles are removing energy from Earth through the collapse of matter as well as releasing energy through dark matter annihilation. This will effect Earth’s overall energy/thermal balance. It is very hard for nature to muster up and organize the energy required to create a hurricane all by herself, she needs the help of dark matter and its dark energy to organize the storm and condense the water vapor. Uncertainty. Dark matter creates more uncertainty in our world as it collapses all forms of matter over time. Hug your loved ones each day. My theory proves there is also risk in not getting out of bed in the morning. The massive energetic dark matter particles have the ability to trigger transmutation of elements within their path. This is probably what created much of the veins of ores within the earth. It should be a love/hate relationship between humans and dark matter. It created our world & weather which sustains us but in the end it can and will collapse all matter. Dark matter can temporarily decrease Entropy in our environment, carving out beautiful patterns in the earth and sky. Eventually the entropy gained by the dark matter gets released back to the universe as Hawking radiation so thermodynamic laws should prevail. Humans need to figure out how to detect the massive particles in space and redirect them before they reach us, which may be difficult to do. Possibly either gravitationally or by annihilation. Weakly interacting massive particles (WIMPS) should be removed from the science books and references. Maybe MAMPS (Massively Acting(through many orbits) Massive Particles) would be more accurate. The reason the universe is not teeming with matter-based life is because dark matter opposes it, passes through it and limits it. It is more likely that advanced civilizations/intelligence will either have mastered dark matter or possibly be composed from it. There are most likely dark matter particles orbiting near and through the earth all of the time. SETI should search for signals in the spectrum emitted by dark matter particles (Hawking Radiation) and low energy nuclear reactions, which match the energy profile detected within crop circles. Thank you for your time and Godspeed. Crop circles (genuine ones) identified by Oak Ridge scientists were found to have transmuted elements. The author suggest this would require deuterium to be accelerated to unheard of speeds. Then the cloud top particle accelerators were discovered to be able to provide the required energy. Recently scientists have found that the edge of a planets magnetic field is most likely the source of ultra high energy cosmic rays, not some exotic across the universe. If Sol is a magnetar unwinding, the source of the energy ‘balls’ striking Earth is then known. I agree, and those entropic quantum energy balls are orbiting and disturbing Earth and its atmosphere. I also believe Earth is creating her own cosmic rays. I think the auroras are her jets, a by-product of coalescence.